FANBOY PLANET.com . 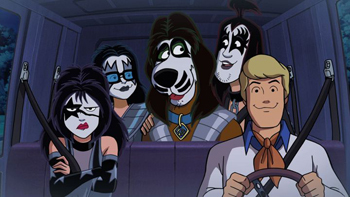 : Scooby-Doo-KISS :. The Greeks had it slightly wrong. You either die a Rock God or live long enough to become children's entertainment. That's not a bad thing, because certainly Warner Animation and KISS put a lot of effort into making Rock and Roll Mystery a blast. 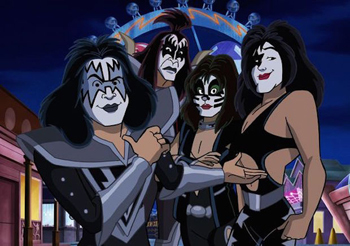 The first of many questions it raises, however, is why has it taken so long for Gene Simmons and Paul Stanley to give in and become the glorious cartoons they were destined to be? That's asked with respect. For all his bombast and tongue muscle, Simmons has always been unabashedly pro-pop culture. He claims to have learned English from comic books, and though he's a little old to have likely watched Scooby Doo, Where Are You? the first time around, Hanna-Barbera still probably taught him a thing or two. Building off the loose mythology KISS has built up over the decades, the plot teams the band with the Scooby Gang as they try to crack a two-fold mystery. Who is the Witch terrorizing KISS World, and why doesn't said amusement park actually exist in real life? No, seriously, it's also about the band trying not too hard to cover up that they're also cosmic champions of rock trying to stop "The Destroyer" (voiced by Darius Rucker) from returning and laying waste to KISSteria, the homeworld from which all ethereal rock and roll doth emanate. 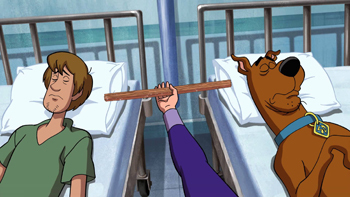 Along the way are all the expected hallmarks of a Scooby Doo mystery, peppered with the meta-commentary that has been injected into the series for more than a few years. Somehow it's not arch, but fun. The jokes work on two levels without necessarily alerting children that they're missing something. And ultimately, it will do what KISS intended -- make a new battalion of pre-teen fans for the KISS Army. Tony Cervone and Spike Brandt acknowledge it all. "Starchild" (never called Paul Stanley here, though voiced by him) preens as a dreamy idol, but still manages to be chaste in his seduction of Daphne. The Demon (voiced by Simmons) never misses an opportunity to flick his tongue, and one does have to wonder about his advice for breathing fire. The band's hypermarketing is satirized, too, with frequent KISS collaborator Doc McGhee voicing "Chip McGhoo," who always has just the right licensed product the team needs at a ridiculously expensive price. And yes, I am intrigued by the KISS toilet, and also in hindsight wondering why the joke of KISS branding and mark-up didn't extend to the price of amusement park churros. When things inevitably get cosmic, Brandt and Cervone insert a huge Jack Kirby influence in the design. Put that side by side with a stylized title sequence, and this may really make the case for a KISS show -- at least on Adult Swim. The problem for old-timers is that Rock and Roll Mystery really trades on the music of our youth. Though a couple of newer songs sneak in, they don't have the impact of the older stand-bys. To really keep excitement up, it's hard to go deeper than "Rock and Roll All Night," "Detroit Rock City," and "Shout It Out Loud," which are all almost 40 years old. 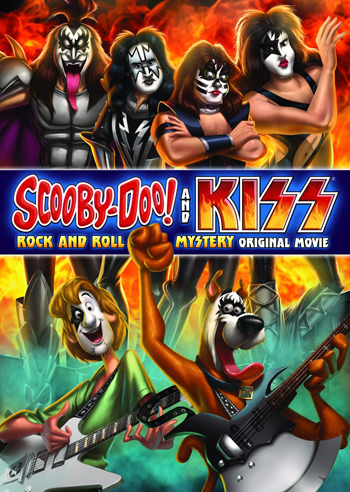 As far as their amusement park movies go, this more than makes up for KISS Meets The Phantom of the Amusement Park, originally produced by Hanna-Barbera. And despite its "cosmic importance," Rock and Roll Mystery drops the pretense that there's something prfound going on with KISS' mythos. The Elder is voice by a 70s sitcom star, for Demon's sake! Instead, Rock and Roll Mystery is what KISS always was for so many of us: it's just FUN.